ROME — Leading a prayer to God for the grace to feel ashamed and repentant for so many sins in the world, Pope Francis highlighted the hope that always comes from Jesus. There is hope “because your church, holy and made up of sinners, continues even today, in spite of attempts to discredit it, to be a light that illuminates, encourages, comforts and witnesses your unlimited love for humanity, a model of altruism, an ark of salvation and a source of certainty and truth,” the pope said. There is hope “because from your cross — the fruit of greed and cowardice of many doctors of the law and hypocrites — came the resurrection,” which turned darkness into eternal light and shows that Jesus’ love is their hope, he said. At the end of the Stations of the Cross in Rome’s Colosseum March 30, the pope read a prayer he wrote, asking Jesus to help “strip us of the arrogance” of the unrepentant criminal that was next to him at his crucifixion and to become more like the “good thief” who was filled with shame, repentance and hope when he gazed upon Jesus. 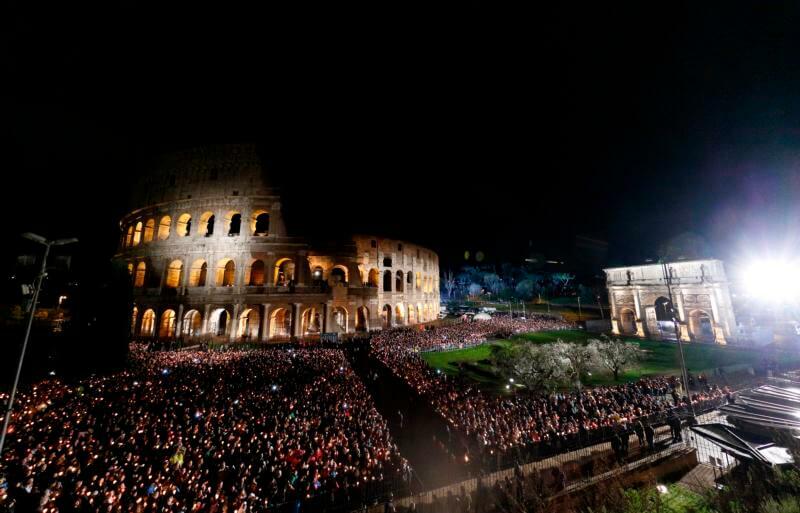 In his prayer, which he read from a hillside overlooking the crowds holding candles and a torch-lit cross, the pope listed a number of sins and the shame they cause when one gazes upon Jesus’ supreme act of love. There is shame for: having abandoned God or mocked him when things got difficult; choosing power, appearances and money over God; there being so many people, even some clergy, who let themselves be misled by ambition and vainglory; leaving younger generations “a world broken by divisions and wars, a world devoured by selfishness where the young, the least, the ill and the elderly are marginalized”; and the shame for having lost all sense of shame. Repentance comes from recognizing one’s “nothingness” and knowing with certainty that only Jesus can “save us from evil, only you can heal us from our leprosy of hatred, selfishness, pride, greed, revenge, cowardice, idolatry,” he said. Missionaries, too, bring hope, he said, because they are the ones challenging humanity’s “sleeping conscience” by risking their lives to serve others, including immigrants and the exploited. The meditations for the late-night event were written by 15 current and former students of a high school religion teacher in Rome. The pope wanted the reflections to be written by a group of young people as part of giving them a voice before the upcoming synod of bishops. Earlier in the day, Pope Francis presided over the Good Friday Liturgy of the Lord’s Passion, which began with a silent, solemn procession down the central nave of St. Peter’s Basilica. Two aides then helped the 81-year-old pope down onto his knees as he stretched himself prostrate on the floor before the main altar of the basilica. His bare head rested on a red pillow, in silent prayer, in a sign of adoration and penance. As is customary, the papal household’s preacher gave the homily. Capuchin Father Raniero Cantalamessa said that while the church listens to young people in preparation for the synod, the church must not forget to also help them listen to Jesus and discover what he has to offer. Repeating the pope’s call for all Christians to renew their relationship with Jesus or at least be open to letting him encounter them each day, the Capuchin priest said God has a special mission for young people. The ability to be totally giving and welcoming of love requires long preparation, whether it be for the vocation of marriage, religious life or service, he said. Jesus on the cross is an example of giving himself for others carried to the extreme, and Christians are called to be courageous in going against the current cultural stream of selfishness and going against the crowd that chases after worldly things, he said. These mistaken ways are then seen as “the norm” so that when people “act, think or speak against this spirit (it) is regarded as nonsensical or even as wrong and criminal,” he said. He encouraged young people to go the opposite direction where Jesus, “our God and savior,” awaits. After the homily, the assembly venerated the cross, which was carried down the central nave and held before the pope. The pope had removed his red chasuble and, in a sign of penance, placed a red stole over his shoulders. He kissed and leaned his head against the cross.